Gymkhana. Jim-kah-nuh. Say it with me. Gymkhana! Okay, so now that we can all say it without butchering the pronunciation of it, what is it? The actual dictionary translation is; a field day held for equestrians (fancy word for “horsey people”), consisting of exhibitions of horsemanship (fancy word for a good rider), and much pageantry. 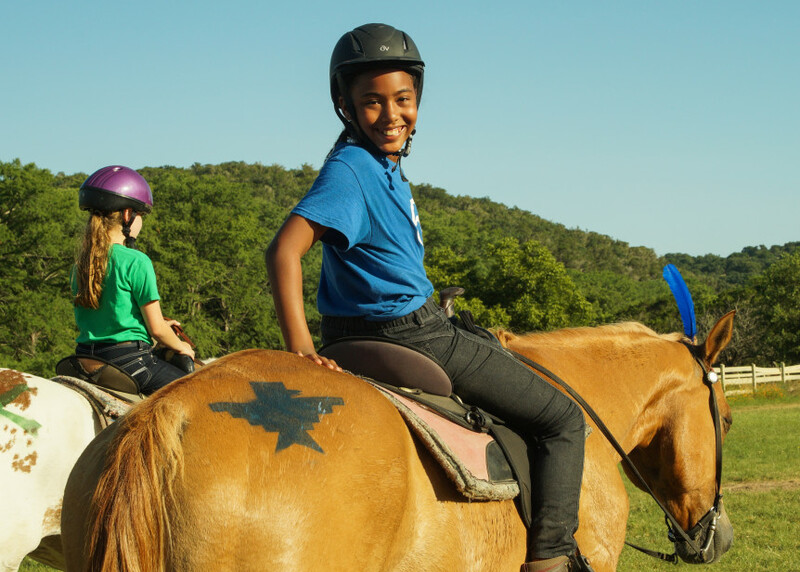 Only that still doesn’t mean a whole lot to many people who have campers competing in horseback at camp! So let’s break it down some shall we? ainst the other in every event. I’ve listed a few examples of games and events below. 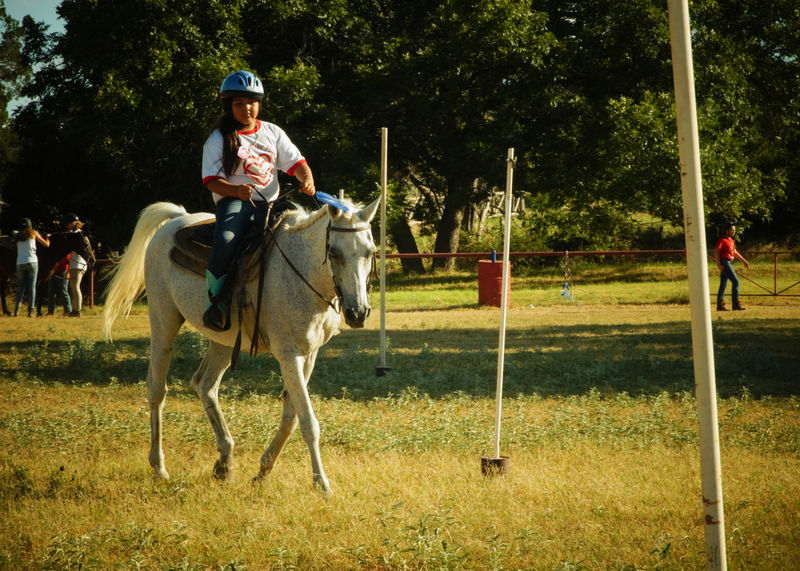 Barrel Race- this includes three barrels that the kids weave through in a certain pattern as fast as they can. The team with the lowest total time wins! Pole Bending- a weaving race that usually includes some sort of task at the end (ie. apple bobbing, switching horses, passing a baton, etc.) This can be done as a relay or a timed race like barrels. Australian Trotting Race- competitors must trot in a large, marked circle and try to pass the person in front of them without breaking stride (walking or cantering), or be passed by someone else. It’s very similar to cat and mouse or catch the tail. Last one standing wins. Basic Relay- riders take their horses through a set pattern as fast as they can and then the next person in line goes when the first one finishes, and so on and so forth. The first team to finish wins! We usually have gymkhanas in the evening after the kids’ classes and before dinner. 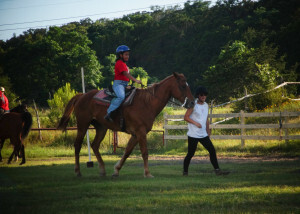 The girls competing that day help us (the horseback staff) to tack up and get the horses prepared for the excitement. The rest of camp joins us soon after at the big arena and sits in the grand stands to cheer on their friends and tribe members. There used to be a “no cheering” rule at gymkhanas here at HOH because they believed that it would spook the horses, but our horses are so used to hearing hooting and hollering that I encourage the kids to cheer. It makes the campers more excited and pushes them to perform well. I usually like to dress up like a rodeo clown and wear funny tutus and hats to get the crowd going. I often throw fun things like bubbles and beads to the kids who cheer the loudest. Most gymkhanas are pretty chill and laid back, and we usually run through them smoothly and quickly, with most of them lasting no more than an hour and a half (that’s less than a movie!). 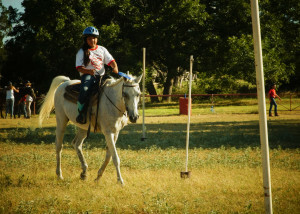 But then there is the All Camp Gymkhana. That’s another story. We have to have the whole event planned extremely carefully or we will have a disaster on our hands. For closing, we have all the events and times figured out, who is in what race, and what horses will be used and where. Gymkhanas really aren’t too complicated, but I hoped this helped clear some things up for those of you who have never attended one!